An exchange is a swap of two pieces with the same value. Let’s see an example. 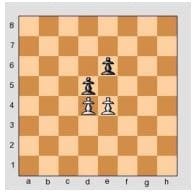 White could capture the pawn in d5, but Black could take the White pawn back in d5. If this happens, this is called an EXCHANGE: a swap of two pieces of the same value.